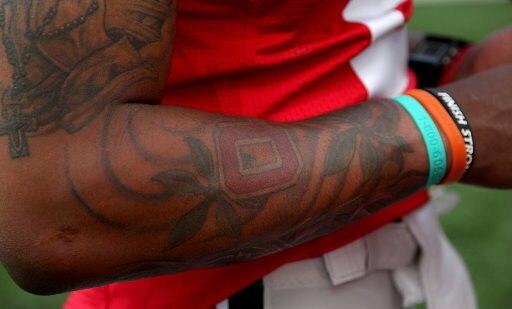 Terrelle Pryor and four other Buckeyes were suspended by the NCAA this past week. The suspensions however, have been suspended until after their Sugar Bowl game next week and will begin next season. Apparently the NCAA just found out that they had a bylaw stating that if a player breaks a rule that he isn't aware of, the suspensions may be lifted to allow him to play in a championship game. How convenient for the NCAA's partners the All State Sugar Bowl and ESPN. This judgement came down after it was discovered that the 5 OSU players had sold some of their own gear including Pryor's "Sportsmanship Award" from last year's Outback Bowl. In the NCAA's world it is an unfair advantage for players to sell their gear because it is related to their sport and image as an athlete not a student. It wouldn't be very amateurish for players to profit in any way from their athleticism and connection to the sport, however it makes perfect sense for the NCAA to conveniently find rules which allow their marketing partners to preserve their maximum profit. The NCAA has had to make rulings in several high profile cases this year and there doesn't seem to be any consistency across their judgements. When Reggie Bush was given a house for his stellar play at USC, the NCAA ruled that the school had to forfeit their Championship season, lose scholarships, and would be bowl ineligible for the following two seasons. Meanwhile Reggie, who committed the infractions wasn't punished by their ruling at all, despite being "compelled" to give back his Heisman trophy. Cam Newton and his Father were allegedly shopping Cam's commitment last year for $180,000. The NCAA was somehow able to determine that it was all Mr. Newton's doing and Cam had no knowledge of this so he was allowed to continue playing with no restrictions at all. Last year Dez Bryant was suspended for the second half of the season after the NCAA found out he lied when they interrogated him about spending time at Deion Sanders house over the Summer. Dez lied about being there because he was scared that he somehow broke an NCAA rule he didn't know about, however, the NCAA determined that he didn't actually break any rules but still proceeded to suspend him for the final 9 regular season games and Oklahoma State's bowl game. Aside from the ridiculous Dez Bryant suspension for not doing anything, these Ohio State players have clearly gotten the worst deal. In my opinion, selling things you own, no matter who you are or how you've come to (legally) own them, is not illegal. Apparently they were "selling" some of these things, including autographed stuff, in exchange for tattoos. The NCAA is trying to ensure a level playing field for student-athletes and schools but I just can't see how players selling some of their old gear for free tattoos gives them any advantage. This ruling somehow just seems spiteful. In the end this suspension is probably going to cost Pryor millions of dollars either if he feels forced to declare for the NFL early or if he decides to stay in school (which he should) despite missing the first half of next season.